This guide will assist you by providing you with the knowledge needed to choose the best pre-rinse unit for your commercial kitchen. Selecting the perfect pre-rinse unit will begin with deciding which features you need. How you plan to use the new unit on a regular basis. The foundation of all selections will rest on the sink surroundings and the use of the new unit. Unique add-ons and accessories will meet your current job needs and that will continue to meet your job needs for years to come. Basic features must be identified, because each of the unique features, add-ons and accessories are based on these basic features. 6. What is the primary plan of use for your pre-rinse unit? 7. What are your space restraints? 8. Do you have overhead limits? Unusual or unique inlets: consider inlet adapters and elbows for secure connects. Where is the water source? If the water source is in an unusual place or position: consider selecting a remote control. If the water source is deep in the sink: consider a pedal valve. Consider selecting a front water source or retrofits. Consider selecting a high-flow option like Big-Flo faucets which range from 17-55 gpm. Consider selecting a side-spray unit or low profile model that includes a swivel option, because this will offer a larger range of motion. Will your pre-rinse unit be used in multiple tasks? A pre-rinse unit can be configured properly to perform a wide variety of tasks in tight spaces. 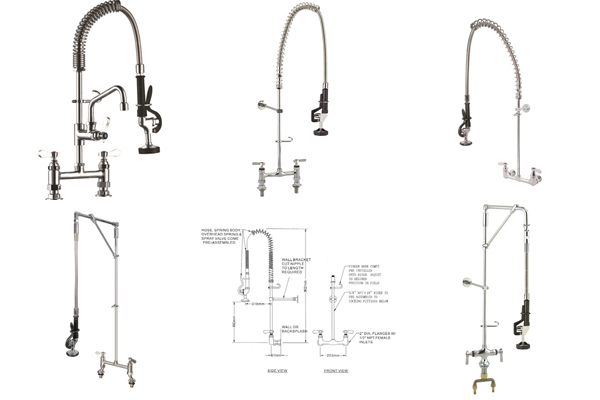 Add-on faucets and spray valves are good options for multitasks. There are a number of parts that can be selected for popular models. 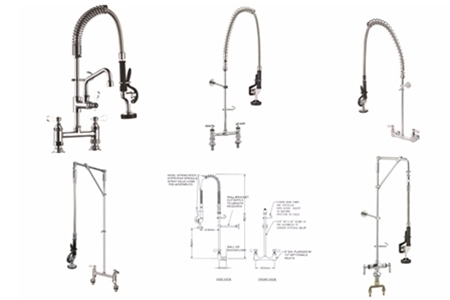 This guide can assist you in selecting the perfect pre-rinse sink for your needs. You can identify parts that you would like included on your rinse-sink and your sales rep can assist you in putting it all together. The overhead swivel arm pulls down while in use and is best for commercial general pre-rinsing. This is suitable for single or double compartment sink and is easily maintained. The Roto Flex with overhead swivel arm balancer is best for low overhead support. The overhead Roto Flex support allows the hose to easily move up and down and to retract out of the way when it is not being used. This is for single compartment sinks. The overhead swivel arm provides horizontal spraying range that is atop a riser that swivels. The hose allows free spraying motion, horizontal range of motion but restricts up and down movements and may experience abuse from employees yanking or swinging the hose to force range of motion. This is beneficial for a three compartment sink. Hose easily retracts and allows for maximum reach with a tall riser that is supported from overhead. Over a five foot range that reaches in all directions. Rinse out additional equipment or fill other sinks. Multiple hose lengths are available for versatile use. The low profile is best for confined or tight spaces with a low overhead. Best for general rinsing in a one or two compartment sink. Smaller frame with an overhead spring. The low profile is able to provide powerful results. The B-0107 is the industry leader with outstanding performance and reliability. This is best for heavy use in commercial kitchens. This is a superior quality spray valve that is used for most general applications. This is the lowest flow rate available and is best rinsing trays without baked on residue. This is a newer product that reduces cleaning time and removes baked-on residue while conserving water, time and energy. The design is recommended for older employees and reduces fatigue. This is designed for heavy commercial use. A superior spray is generated and it is best suited for general use. This offers the lowest flow rate and is the most ergonomic brand. Best for rinsing trays without baked on residue. Good for older employees and extended use. Uses an economical valve best for general applications. This offers a low-cost option. Uses a low-flow spray valve and it is a low-cost option for water conservation. This is a quick connect spray valve that allows you to swiftly switch valves in order to complete a variety of the tasks. This is best for maximising space in shared work areas. ENCORE – MINI- Best in tight Spaces & Height Restricted Areas. The encore mini is specifically designed for commercial kitchens with height restrictions, and it provides the flexibility and performance that is offered by the standard rinse unit. The Encore-Mini can be used in tight spaces or with height restrictions. 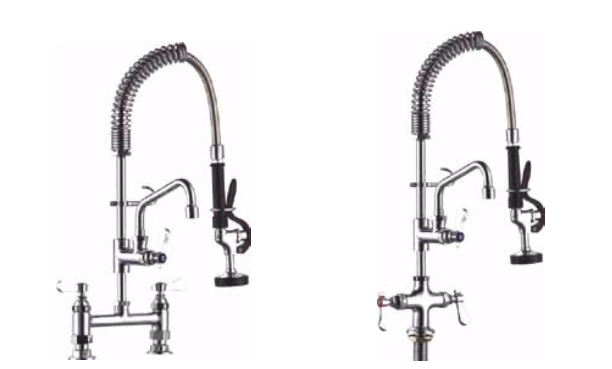 This unit includes a six-inch swing nozzle and an add-on tap. ENCORE - Spring Type- Multitasking Spring Type Head. Pre-rinse flexible hose begins at 45" (1143mm) in height. A wall bracket is supplied, and accessories and additional add-on taps are also available. The H20 Straight Arm Pre-Rinse Unit is a heavy duty unit that is suitable for hotel, restaurant, kitchen and other commercial use. The straight arm Pre-Rinses begins at 35" (895mm) in height. 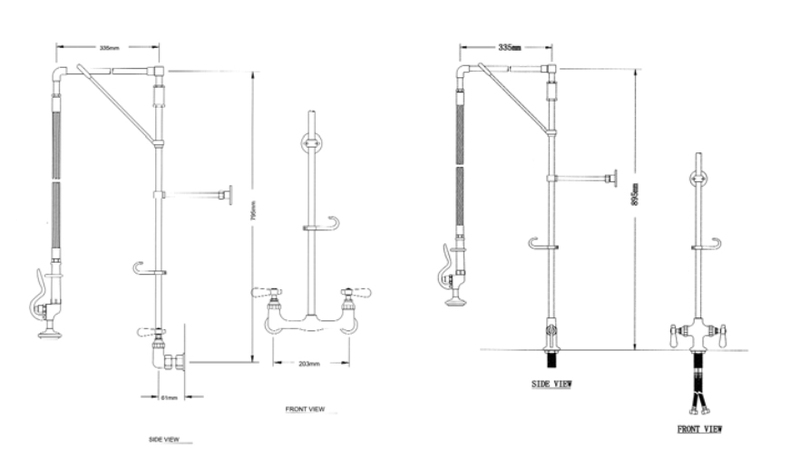 Check valves are included which prevent cross-flow, 12" wall brackets offer secure installation and the heavy duty arm swivels and add support to strengthen and prevent damage. Additional accessories and add-on taps are also available. The Die-Pat commercial kitchen ENCORE pre-rinse unit includes a heavy gauge swivelling arm that is mated to a solid, forged swivel elbow and it is designed to withstand continuous operation and commercial demands. This unit is available with a 12" (304mm) or 18" (457mm) swinging arm that offers a full 360o rotation. The Encore Commercial Pre-rinse unit is furnished with a conventional spray head and the exclusive ENCORE money and water saving spray head.